We finished the mural project this week. Leah Samuelson has been here for eight weeks as a representative of Artist on Call, an organization that provides artists to work with children in areas that are in distress, are at risk, or have suffered catastrophe. The museum received a post hurricane grant to do several art related initiatives that Leah has been leading. 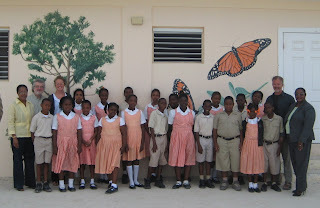 We have completed three murals, held three water color painting workshops, a portfolio review, and gave presentations to both the West Indies Collegiate and the Meridian Club on Pine Cay. Today an article came out in the newspaper about the mural we painted on Provo. On Wednesday Dr. Nathan Corbit, the founder of Build a Bridge and Artists on Call, flew in to the TCI to see the work that Leah Samuelson has been doing with the museum. This is the longest that Artist on Call has ever had an artist in one location, and this is the most murals they have ever completed in one location. Dr. Corbit and his wife were here for the dedication of the Ona Glinton Mural on Thursday with the Permanent Secretary of Education, Dr. Fulford. They flew out today. We neglected to get Leah a ticket to fly out until this morning. She has just missed the first two standby flights, and now is going to miss her US Airways flight out of Provo. This may be an unexpected mini vacation for her as we were still working on the large blue mural until yesterday, and today the weather is great. But, maybe just an overnight in Charlotte.